Rolex Oyster Perpetual Datejust 279381RBR. 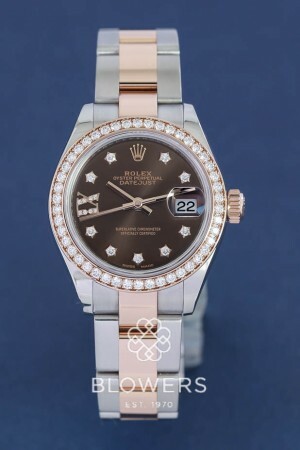 Rolex Oyster Perpetual Datejust 279381RBR. 28mm Steel and Rose Gold case, diameter 28mm. Water resistant to 100 meters. Automatic Chronometer movement, Rolex Caliber 2236. Power reserve of 55 hours. Chocolate dial with Diamond hour markers and fully set diamond bezel. Scratch-resistant sapphire crystal with cyclops date lens. Steel and 18ct Everose gold oyster bracelet. Folding oysterclasp with comfort extension link. Box and papers dated December 2017. SKU: 3002188. Categories: Datejust & Date, Ladies, Rolex.